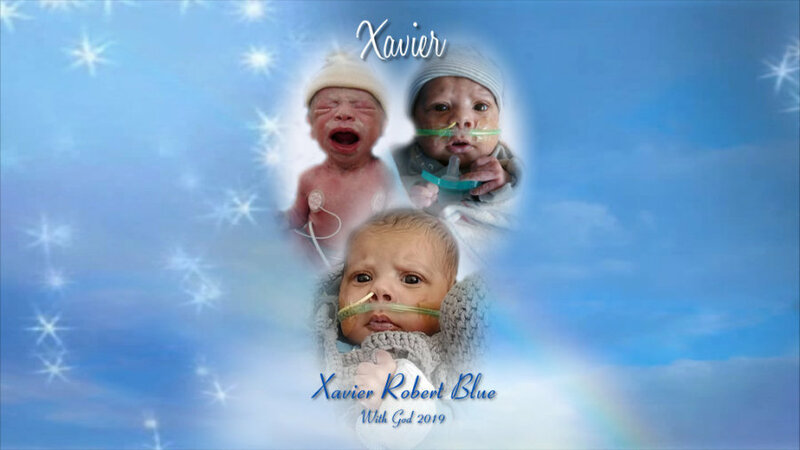 Obituary for Xavier Robert Blue | Kenworthy Funeral Home, Inc.
Xavier Robert Blue, 2 months, of Hanover, PA, entered God’s eternal care Friday, March 29, 2019 at his home with his loving family by his side. Born January 18, 2019 in Philadelphia, PA, the son of Adrian A. and Jasmine C. (Franklin) Blue. Although he was only here for a short while, he left a huge mark on those that loved him dearly. In addition to his parents, Xavier is survived by his paternal grandparents, Darrell and Tina Costley of Hanover, PA, his maternal grandparents Michael and Laura Franklin of Hanover, PA, as well as many aunts, uncles, and cousins. A service to celebrate and remember Xavier’s life will be held 6:00 PM, Friday, April 5, 2019 at the Kenworthy Funeral Home, Inc., 269 Frederick Street, Hanover, PA, with Pastor Jeff Deitrich officiating. A visitation will be held from 5:00-6:00 PM, Friday, April 5, 2019. In lieu of flowers, memorial contributions may be made to Little Mended Hearts, 609 Meadow Lane, Clarks Summit, PA 18411.